There are ZTechnik® Accessory Mounts specially made for specific models as well as Mounts that are universal to a number of BMW motorcycles. In most cases, you can choose from a range of different Accessory Mounts to suit your needs. 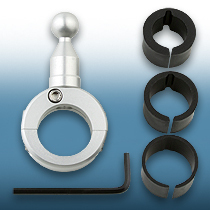 All 4th Generation Accessory Mounts feature the universal 17mm ball adapter for mounting top plates and adapters. All handlebar-mount models include adapters for 7/8", 1.00" and 1.25" handlebars. Whichever ZTechnik Accessory Mount you choose, you will also have a wide variety of accessories and adapter plates that allow you to mount almost any electronic device you may want to bring along on your ride. 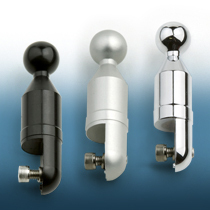 ZTechnik® Accessory Mounts are made from super-strong 6061 T6 Aluminum and Stainless Steel, and are finished in Anodized Black, Anodized Silver, or Brilliant Chrome. All screws and bolts are polished stainless steel. 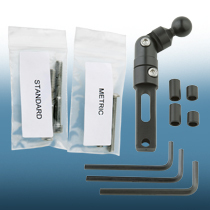 All Accessory Mounts include installation instructions, mounting hardware, installation tools, and (where applicable) Velcro® industrial fasteners.